It never fails. This time of year, I turn on the TV in the morning and I see the red clay and I can only think of one thing (and it's not the Garth Brooks song). I was one year out of college and bouncing around the country working on baseball, football, basketball, boxing, and tennis, trying to get my foot in the door of the TV business. 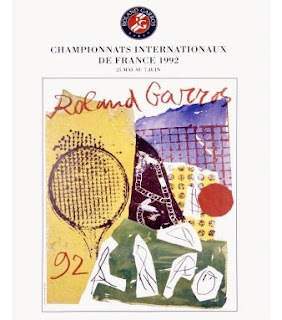 Then I had an opportunity to go to Paris and work for ESPN on the 1992 French Open. No flight, no hotel, just $175 a day for 3 weeks. For a 23 year-old single guy, I thought it would be a great experience. It turns out that I wasn't as ugly an American as I thought. My burgeoning coffee addiction and pack-a-day cigarette habit fit right in. I enjoyed sitting at cafes and partying at discotheques. I loved staying at the flat of a friend-of-a-friend in Monmarte and riding the Metro to work each day. When you got your change at the grocery store, the cashier actually said voila, and the moped rider on the opposite side of the street would actually stop for an attractive woman, whistle, and shout ooh la la! Mind you, this was before the internet, cell phones, ESPN2, and before Derek Jeter and Mariano Rivera changed history. I was wide-eyed and wasn't distracted. That year, I was in the stands to see one of the great events as Monica Seles defeated Steffi Graf in the Women's Final 10-8 in the final set. Jim Courier was at the peak of his career, winning his second straight Men's title, quickly dismantling Petr Korda. Courier thanked the adoring crowd by accepting his trophy and addressing the Court Central faithful in French. A nice touch. These days, the French Open isn't much of a mystery, at least on the men's side. 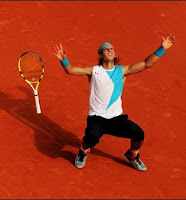 I saw an article recently titled: French Open Preview - What's The Point? That's because Rafael Nadal has never lost a single match at Roland Garros. He's won 4 straight titles, including 3 in a row over Roger Federer. But mostly I remember my experience there for the work. I didn't know what I was going to do there, but somehow wound up in a great spot. I sat in front of a computer that was spitting out real-time scores all over the grounds. I had a walkie-talkie with two channels - one for each camera crew I was directing to various locations on the outer courts. And it was mostly based on my instincts. If there was a great match, upset brewing, American result on the line, or we just needed video on an up-and-comer, it was my job to send the crews to the right spot, then inform the producer when they were in position. He would determine whether to go live or roll it back as a taped highlight. Pretty heady stuff for a guy who was essentially an extra to start. But after returning home and getting back into the grind, I now realize I didn't have the maturity or the people skills to handle my new-found success and responsibilities. My career changed direction, and it wasn't exactly my decision. By the next year I was on the inside, but working my way up from the bottom. I worked at HQ for 3 years, but decided to go free-lance and move to New York to improve my life if not my career. You can't fret about the life decisions you make when you're young and a little impulsive. Everything leads to where you are. – If we lose them, we lose ourselves." Experience dictates everything. And I have a lot more to remind me of my one spring in Paris than just a Roland Garros necktie.